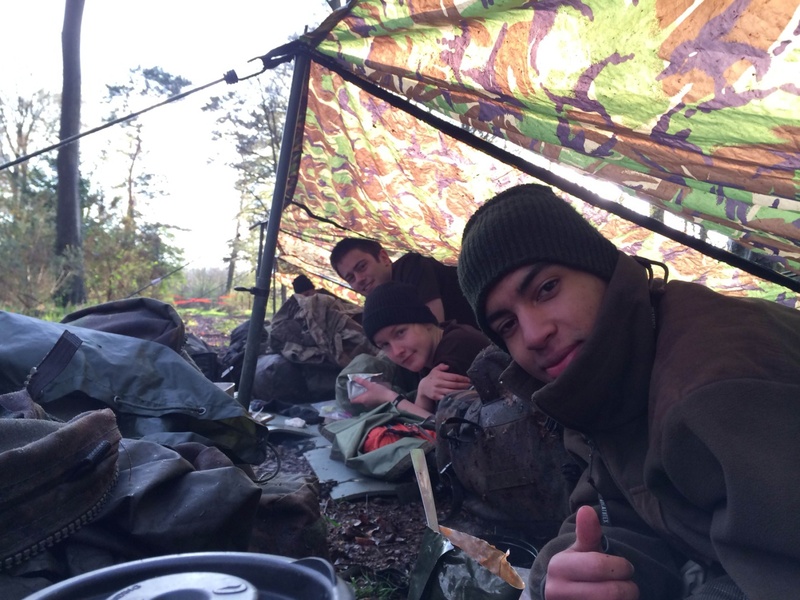 During the University of Southampton’s Easter break the squadron participates in numerous adventurous training exercises including kayaking, mountain biking, skiing, caving, and climbing. I attended the squadrons annual “Easter Ex.” The exercise took places at Salisbury Plains Army base. The exercise was broken down into three stations: construction, support and enemy. The first day I was at the support station whose mission was to collect and deliver supplies to our friendly forces at the construction site. This required us to set up two lookout posts, properly chart our routes to collect our supplies, deliver our supplies without the use of vehicles, and send patrols to protect the constructions site and our delivery teams. After this rotation we met the CO at a river to learn proper crossing techniques. One consisted of using our rucksacks as a flotation device and swimming across and the other required us to build a raft using our waterproof tents, two rucksacks and two pieces of wood. After crossing the river we headed to the enemy station. At the enemy base we carried out patrols to sabotage the delivery teams. We did this by hiding at the drop off point and ambushing the delivery patrol. We were able to steal some supplies and bring it back to our base. Our last stop was at the construction site where we were tasked to build a prisoner handling facility. The first two platoons had built most of the facility; however we still had one more building to build with limited supplies (duct tape and zip ties came in handy). Once we completed the facility we stood watch and captured one prisoner. On the last day we had a battle for the prisoner handling facility with the enemy forces. Since we were unarmed, we spread out around the perimeter and basically had one-on-one football linemen battles with the enemies. After a few minutes the officer’s deemed my platoon “captured” and we had to play prisoner until friendly forces rushed the facility and rescued us. After we had control of the facility and captured all the enemies we “won” the exercises. Overall it was a great experience that taught us to work with little sleep, poor weather conditions, and fatigue due to the long rucks. In total I think I slept about three hours a night and rucked around 50 kilometers with our 20 kg rucksacks. 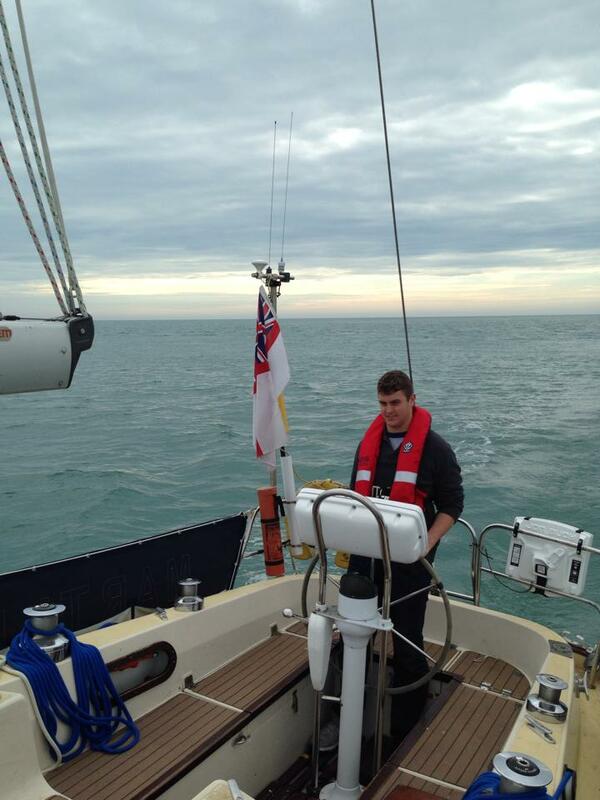 Two weekends ago I sailed from Dartmouth to Torquay with the squadron. The Britannia Royal Naval College, which is located in Dartmouth, provided us with the yachts for the weekend. Unfortunately there was little wind so we had to motor our way over. However, we did put the sails up and practiced mooring the yacht while at Dartmouth. This week in lab we were visited by a Royal Air Force pilot who gave a brief on leadership and the core values of the British military. Afterwards, I was able to talk with him about his past experiences as a pilot. On Saturday we had troop day. A “troop” in DTUS is the equivalent to a “company” in ROTC. Troop day was a chance for us to get together as a troop and do something fun to get to know each other better. Our troop (Anson Troop) chose to go to London for the day and visit some museums. We went to the National Science Museum and the National Maritime Museum. At the end of the day we had a nice steak dinner and headed back to Southampton. This past weekend I traveled to Wales with a few squadron members to do some mountaineering. 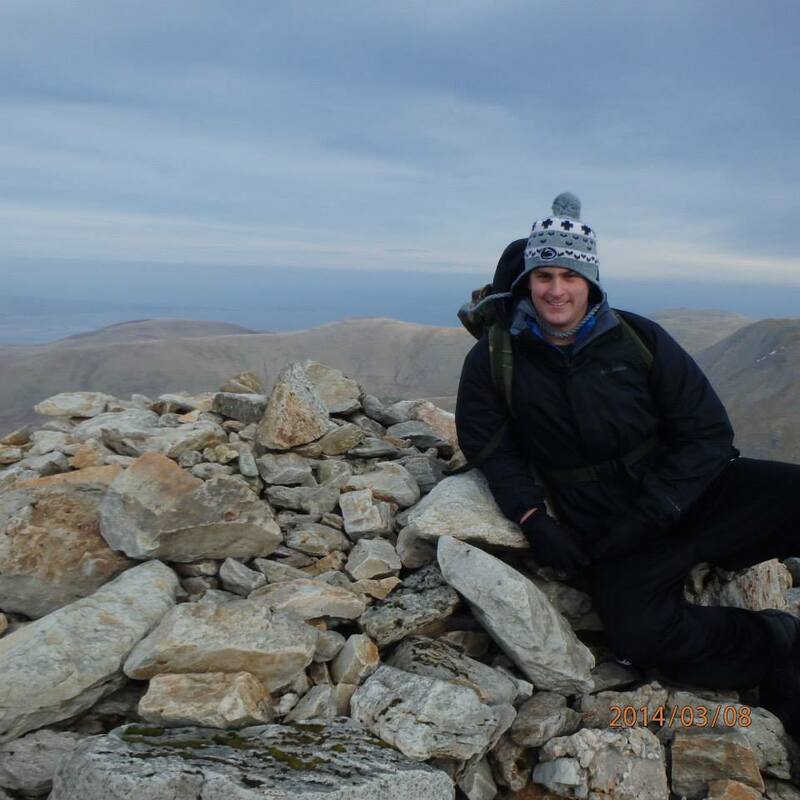 We were lead by a Royal Navy Lieutenant who was a qualified mountaineering instructor. 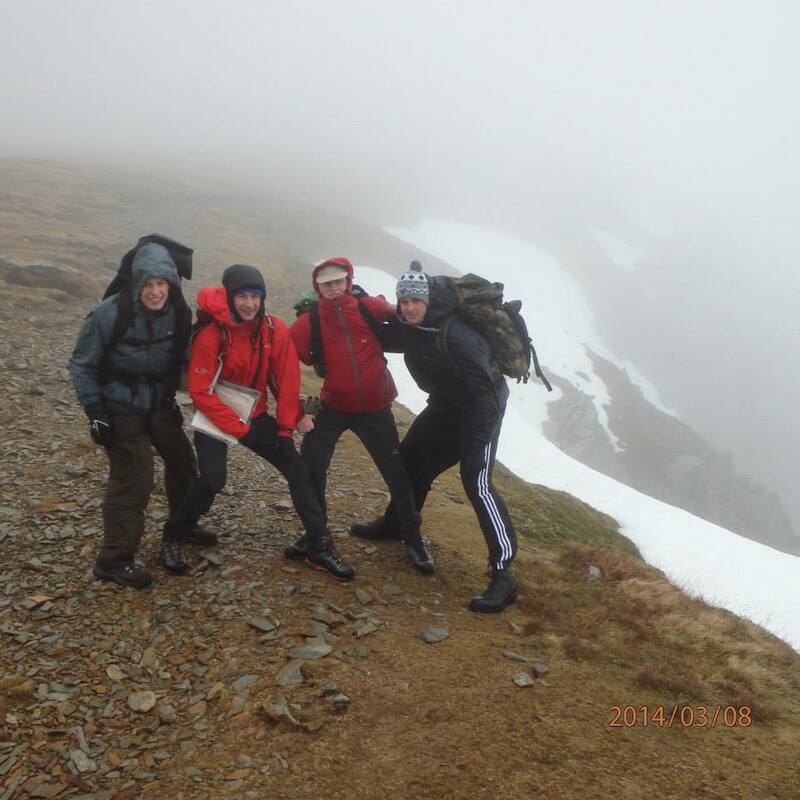 On Saturday we reached three peaks in Snowdonia National Park and traveled roughly 10 miles. On Sunday we hiked the tallest mountain in Wales (Snowden). It was a great experience, especially as a Navy Option Midshipman who doesn’t get any formal training in the mountains. Luckily we had great weather and were able to see some amazing views from the summit. This past Wednesday we had a presentation on the future of Naval Aviation given by the First Sea Lord Admiral Sir George Zambellas (Royal Navy Chief of Naval Operations equivalent). He spoke about the Queen Elizabeth Carrier, Joint Strike Fighter, and Unmanned Aerial Vehicles. 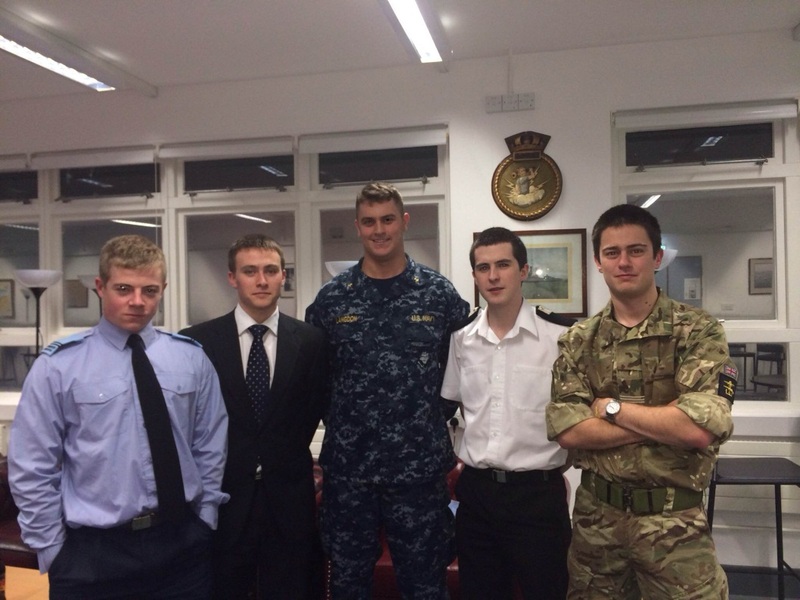 It was a very informative presentation as well as a great opportunity to meet the head of the Royal Navy. Hello, my name is Midshipman 2nd Class Beau Langdon and I am currently studying abroad for a semester at The University of Southampton, located just an hour south of London. I am currently taking part of an exchange program with the Defense Technical Undergraduate Scheme (DTUS). Similar to ROTC, DTUS is a scholarship based program which develops future leaders in the Royal Army, Navy, Air Force, and Ministry of Defense. One major difference between ROTC and DTUS is that students in DTUS only major in engineering or approved technical degrees. Upon commissioning, they will spend their careers serving as engineering officers, rather than the “Jack of all trades” officers we see on ships in the U.S. Navy. There are 4 DTUS squadrons consisting of about 100 students each: Taurus Squadron, Trojan Squadron, Typhoon Squadron, and Thunderer Squadron, which is where I am currently assigned. Just like ROTC, squadron members attend their university courses during the day and engage in military exercises in the morning and evenings during the academic year, as well as taking part in cruises over the summer. Before midshipmen and cadets in the squadron can become officers they must complete training at their respective officer candidate schools (OCS); for example, Royal Navy midshipmen will attend Britannia Royal Naval College in Dartmouth. At these OCS equivalents cadets and midshipman engage in physical activities, leadership exercises, and take classes similar to our naval science courses. I have been here for a little over a month and I am pretty settled in at The University of Southampton and Thunderer Squadron. The squadron’s commanding officer is Commander Chris Ling (RN). CDR Ling specializes in aircraft maintenance and is currently running the squadron with the help of his office administration staff. In addition to CDR Ling there are a few Army and Navy officers, as well as a handful of Upper Yardmen (comparable to our Seaman To Admiral-21 program) who are here getting their degrees and who help out with the training events. So far I have attended three of their training nights. Training nights are different every week. In my first week we engaged in one-on-one debates about popular topics from around the world. We were given a position to take and a limited amount of time to prepare. This was a useful exercise because as officers we may be given a task or order with limited time to execute, yet we will still need to get the job done correctly and direct our sailors with confidence and certainty. The following week we had a visit from Royal Army General Riddell-Webster who is the director of the College of Management and Technology at the Defense College. This past week we were visited by the Defense Science and Technology Laboratory, who led us in a problem solving workshop. For physical training the squadron participates in weekly loaded marches, evening sports, and optional adventurous training. Last week we played bucket ball, similar to basketball and ultimate Frisbee. The game was played with a soccer ball and two spackle buckets. CDR Ling explained to us that this was a great game to play in your downtime with your fellow shipmates because it doesn’t take much equipment and can be played just about everywhere. Thanks to my size I was able to dominate the game. Their loaded marches are different every other week. Two weeks ago we marched with 15 kg packs. This past week we did stations: sprints, tire flips, log carry, upper body, lower body, and water can carries. Adventurous training is offered every weekend; some of the events include hiking, caving, kayaking, sailing, and skiing. As of now I am signed up for a sailing and a hiking weekend in March. There will also be an adventurous training week during our Easter break, which all squadron members are expected to attend. Overall the experience has been great so far. We are looking to continue this exchange in the future and hopefully have one of their midshipmen come to The Pennsylvania State University. I will be updating this blog weekly to share my experiences here in England.